Botanical Solid Cream Perfume Refill for Perfume Locket Necklace - Choose your favorite botanical pure plant fragrance below. Not your typical perfume. These are unique blends of pure botanical essences and accommodating notes that evoke memories and emotions - your favorite flower, spice, chocolate, citrus fruit, leather, freshly mown hay, lavender fields, forest walks, your Grandfather's pipe! Most are unisex scents, and can often be layered with one another for an extra dimension of fragrance. Our perfumes leave a soft scent on the skin that stay close to the wearer and don't overpower the room. Very personal scents! Great for those who are sensitive to synthetic fragrances, or suffer from allergies or asthma. This listing is for one refill pan containing the solid cream perfume of your choice. These will fit in the brass perfume locket necklaces available in my shop. You will receive one refill pan containing approximately 1.5 grams of your chosen solid cream perfume (good for approximately 30 applications). Hand poured and measured by weight, not volume. These little pans are made of aluminum and measure 23mm in diameter. Simply apply a tiny amount of putty underneath to hold in place inside your beautiful locket. 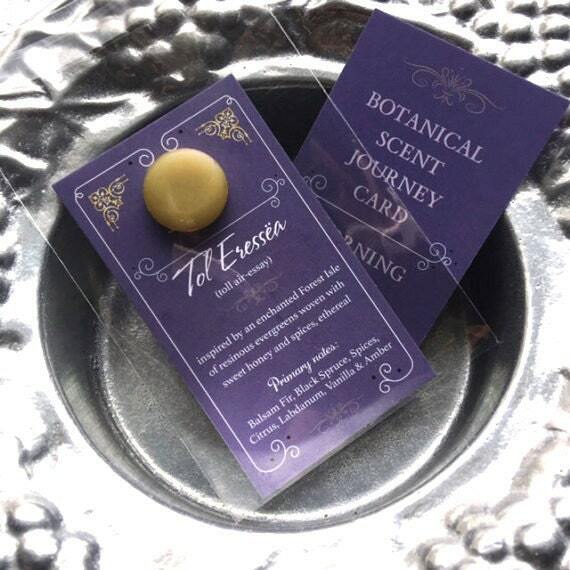 A botanical scent journey card describing the fragrance is also included. Packaged in a clear cello bag for easy removal. An all natural botanical solid perfume with high quality ingredients (organic or minimally processed), including essential oils, absolutes, CO2 extracts, resins, floral waxes, organic golden jojoba oil and raw beeswax. Due to being pure in nature, these solid cream perfumes may need to be re-applied throughout the day to be enjoyed, depending on the wearer's body chemistry. Please note - The raw organic beeswax used in my blends is lightly filtered using organic farming methods. You may notice tiny brown specs of honeycomb and other natural matter from organic processing. This method preserves the natural character of the beeswax.